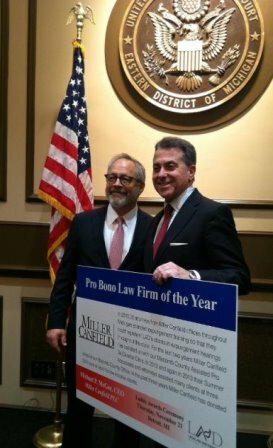 The law firm of Miller Canfield is pleased to announce that it has been selected as the 2013 Pro Bono Law Firm of the Year by the Legal Aid and Defender Association, a nonprofit organization and the largest provider of free civil legal services to low-income residents of Michigan. Pictured: Miller Canfield CEO Mike McGee (right) with Joel Applebaum, Chair of Legal Aid and Defender Association. Earlier this year, Miller Canfield was also named in the 2013 Pro Bono Circle of Excellence by the State Bar of Michigan for its contributions to pro bono work. In selecting Miller Canfield as the Pro Bono Law Firm of the Year, LAD specifically cited the firm’s efforts in representing the association’s clients in expungement hearings. Before Miller Canfield began taking these cases, clients often appeared on their own behalf against trained prosecutors. LAD also commended Miller Canfield’s efforts to help with Macomb County Assisted Pro Se Divorce Clinics in 2012 and 2013. As part of the clinics, lawyers consulted with individuals to review their pleadings, answer questions and offer advice on issues specific to their cases. Miller Canfield will receive the Pro Bono Law Firm of the Year award at the 2013 Laddy’s Pro Bono Awards on November 21, 2013, at the Theodore Levin United States Courthouse (231 W. Lafayette, Detroit). The ceremony will be hosted in the Chief Judge’s Courtroom at 3 p.m., followed by a reception in the Grand Assembly Room.